In 1995, Sonia Levy, a professional pianist living in Stansted Mountfitchet, had the inspired idea of forming a music club based on the village. A small volunteer committee was formed and, with a successful inaugural concert in St John's Church on January 28th of the following year, the Village Music Club was launched. 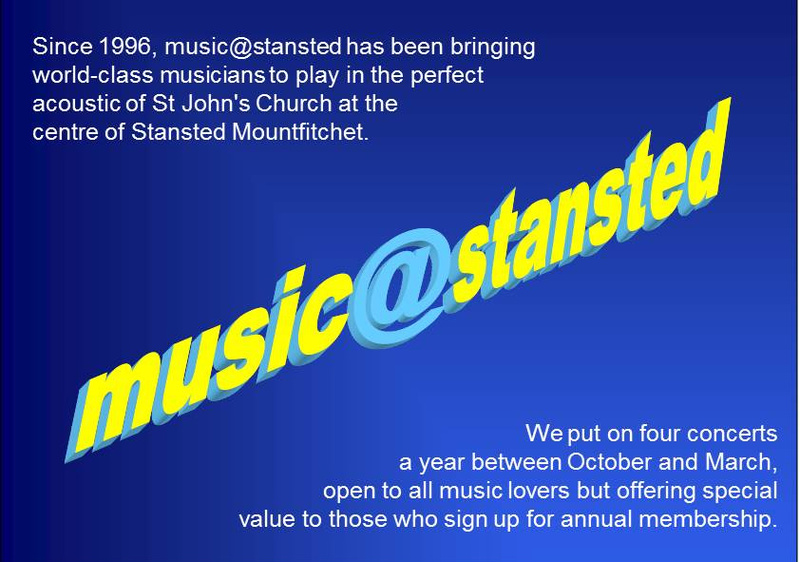 Now grown up into music@stansted, the club's season is from October to March each year. The club usually holds four concerts during this period in the friendly atmosphere of St. John's Church in Stansted Mountfitchet. Membership entitles admission to these concerts at no extra charge. Many more people come to the concerts having purchased tickets at local shops and businesses or at the door. From time to time the club holds special additional events, such as the Summer Soiree, designed to bring together promising young musicians and their audiences over a glass of wine. Britain's achievements in the performing arts today are second to none and the country is home to some of the most outstanding artistes from all over the world. In music, these achievements are not confined to the big orchestras, and the well-known ballet and opera companies: there is an extraordinary diversity of talent up and down the country which is encouraged by the hundreds of professional and amateur orchestras, choirs, opera and dance groups. All this musical activity needs the support of loyal and enthusiastic audiences and this is where we, as a local music club, endeavour to play an important role in bringing music lovers and performers together.